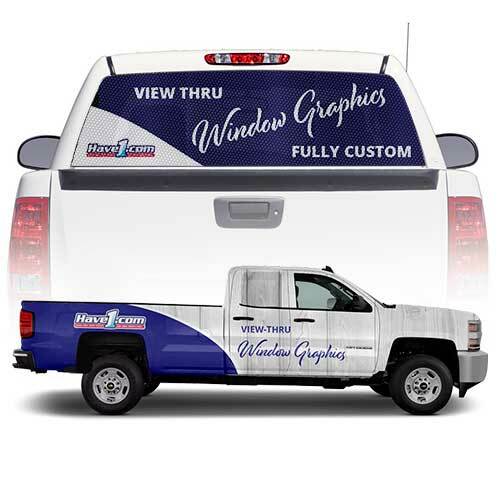 Vehicle graphics are a great way to promote your company’s information anywhere you go. We offer vinyl lettering, colour vinyl decals, view-thru window graphics, partial and full vehicle wraps, plus vehicle magnets, and more. Need a trailer wrapped? We can do that too! We’ve wrapped many different types and sizes of trailers, motor homes, boats, snow mobiles, motor bikes, airplanes, freezers, laptops, filing cabinets, mailboxes, counters and desks, computers, in-store displays, golf carts, garbage bins, buildings, and so much more! As long as it has a smooth surface, we can usually wrap it. Don’t see the product your are looking for below? We do fully custom orders in a variety of products. Contact us today with any questions or inquires. Designing with borders can be tricky. Thin borders outside the safe zone that are less than 1/8th inch thick may not trim evenly. Acceptable File Formats: Please send us your print ready artwork in one of the following acceptable file formats: EPS or PDF, CMYK, at a resolution of 100 – 150dpi at full size of the printed sign. Make sure all fonts are converted to outlines. Custom vehicle graphics completed for our clients. Showing expertly designed and installed wraps, decals, and more! A partial wrap means that only certain areas of the vehicle are covered with the vinyl graphics. A great example of a partially wrapped vehicle is putting a full colour decal on the entire back tailgate of a pickup truck. A full wrap means that the vehicle is covered with the vinyl graphics. A full wrap means that the vehicle is covered with the vinyl graphics. A great way to protect your vehicle from the elements and advertise your business. Vehicle magnets make it easy to display your company’s info on the side of your vehicle for home-based businesses and contractors that need to have the ability to easily remove the decals from the vehicle. Excellent for rental or leased vehicles. View-thru film enables graphics to not obstruct vision when looking through one side, while offering a full colour graphic from the other. Ideal for use on vehicle windows as well as building windows and glass doors. Cut vinyl lettering is easy to apply. They come ready for application and include easy to follow instructions on how to apply the decals. Available on Standard Vinyl, Reflective Vinyl, and Specialty Vinyl. Printed vinyl decals are easy to apply. They come ready for application and include easy to follow instructions on how to apply the decals. The possibilities are endless!